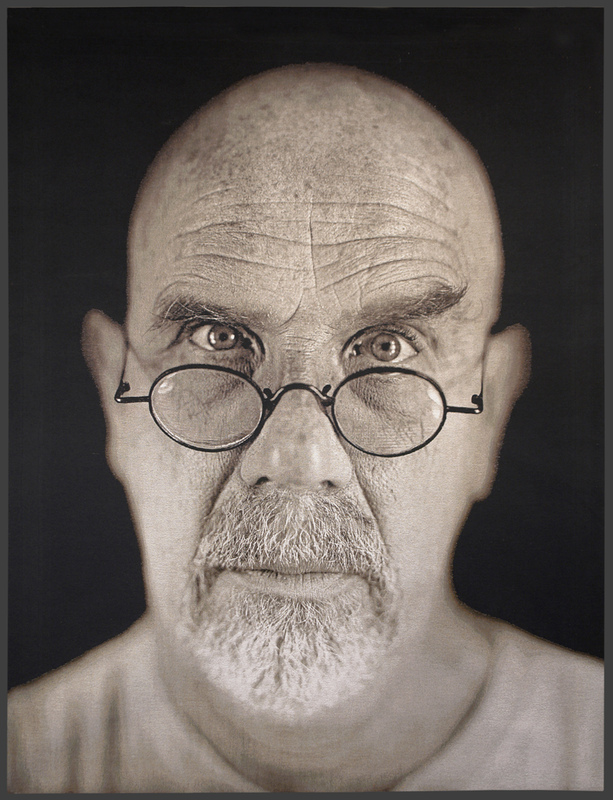 For almost four decades, Chuck Close’s face has emerged from tonal grids of fingerprints, pointillist dots, brushstrokes, paper pulp and countless other media. Close’s countenance continues to serve as a constant throughout his experiments, allowing the artist to foreground his rigorous explorations of the properties and behaviors unique to each medium. A series of daguerrotypes begun in the mid-1990s has yielded a number of self-portraits, one of which became the basis for Close’s second collaboration with the Magnolia Tapestry Project: Self-Portrait, an editioned Jacquard tapestry. The formidable impact of Self-Portrait draws its strength from two sources, with origins separated by nearly two hundred years of history: on one hand, the lyricism and nearly infinite detail of a 19th-century photographic technique; on the other, the Magnolia Tapestry Project’s digitally-driven approach to weaving, a result of experiments conducted only within the last decade. Perhaps more immediate, though, is the unmistakable message of Close’s expression, a determined intensity amplified by both the scale and clarity of Self-Portrait. If one suspects that Close’s resolve to continue refining his craft against all odds is demonstrated by his use of the tapestry medium, the indomitable look in his eye leaves no room for doubt. As the artist’s face emerges in crisp, animated detail from the soft focus of its periphery, the viewer participates in a powerful somatic experience: a wordless, intimate confrontation with a dedicated pioneer.